Burlington Votes "Yes" Streets Not Safe Enough, "Yes" Let's Experiment to Improve Safety! 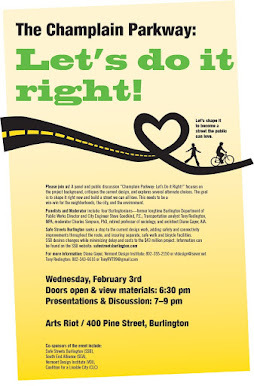 Champlain Parkway "Let's Get It Right" Panel/Public Discussion Draws a Crowd! Over 75 neighborhood and City residents attended the February 3 Arts Riot event-The Champlain Parkway "Let's Get it Right" panel presentation and public discussion. South Ender Betsy Rosenbluth who welcomed the panel spoke of the need for improvements to the South End to reflect the "heart and soul" of the community. Moderator and South Ender Charles Simpson explained how the worst of the highway era lives on in the current Parkway design. Former Public Works Director Steve Goodkind gave a clear history and emphasized the current design represents last century thinking and the need to get the project "right the first time." Transportation policy veteran and roundabout advocate Tony Redington called the project a step backward with increased traffic injuries for the neighborhood and how Vermont tested roundabouts answer the safety and service needs along the Parkway route instead of six instantly obsolete new traffic signals. South End architect Diane Gayer pointed to the choices and opportunity in alternatives which would help the businesses, art community, and overall neighborhood livability. Safe Streets Burlington which seeks Parkway "Stop, Evaluate, Imagine?" meets shortly to determine next steps.